Designed by golf architect Gil Hanse, The Cradle, at 789 yards, features holes ranging from 56 to 127 yards. Upon seeing the first golf course built in Pinehurst, founder James Walker Tufts was struck by how naturally the game fit into the landscape in front of him. “Golf experts and all those who cherish the hope of becoming such will find excellent opportunity to indulge in the game at Pinehurst," Tufts remarked wistfully in 1898. For more information and high-resolution images of The Cradle and its logo, please visit PinehurstMedia.com. 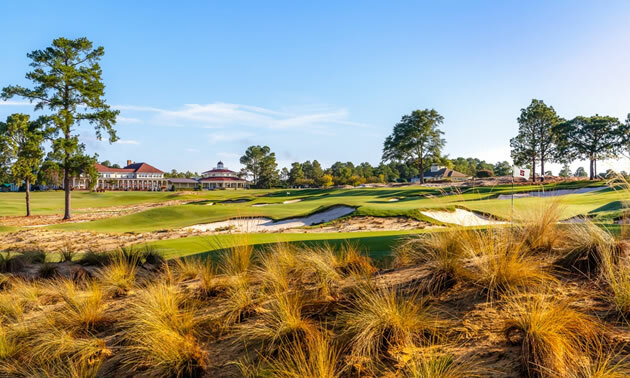 Located in the sandhills of North Carolina, Pinehurst Resort & Country Club, established in 1895, is a 2,000-acre property featuring an award-winning spa, nine golf courses, tennis, and activities for the family. Widely known as the cradle of American golf, Pinehurst has hosted more single golf championships than any other site in America, including the U.S. Open, U.S. Women’s Open, PGA Championship, the Ryder Cup, PGA TOUR Championship and many others. In 2024, it will again serve as the site for the U.S. Open. Please visit pinehurst.com or call 800-ITS-GOLF for a complete list of events and activities.